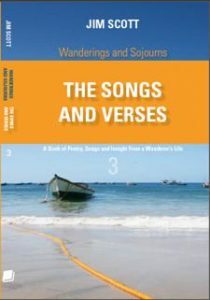 The series under the collective title “Wanderings and Sojourns” is an on-going project that relates the true experiences of Jim’s (some might say) wayward life, as well as providing a venue for his philosophies developed from the lessons learned on his travels. It is also an outlet for his eclectic poetic works , most of which were similarly born from his travels or the philosophies they generated. Each volume in the series is covered by sub pages hereunder in which are listed the stories and poems and (eventually there will be) a few brief notes on each. 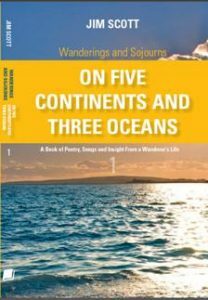 There will also be a reference index showing where you can find stories and poems about certain countries and different types of events. 2/…… https://www.caridiangroup.com/publications/wanderings-and-sojourns-series/on-five-continents-and-three-oceans/ ……is the introductory work which spans all areas and activities that are covered in subsequent volumes in more detail. 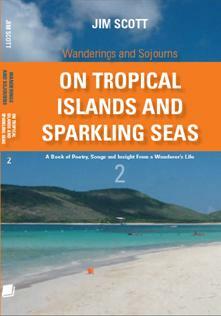 This volume is meant to whet the appetites for the books that follow and consequently there will be, for example, a couple of Island or sailing stories in volume one which will appear again in …..
Volume Two, On Tropical Islands and Sparkling Seas …..
https://www.caridiangroup.com/publications/wanderings-and-sojourns-series/book-two/ ….. which tells stories and relates poems and songs pertinent to Jim’s many years of sailing and Island living, and some of the poems that will appear in both of the first two volumes will again be seen in …..
Volume Three, The Verses and Songs…..
https://www.caridiangroup.com/publications/wanderings-and-sojourns-series/testament-to-rhyme/ ….. which is a collection of over 80 of Jim’s favourite poems and songs from his 40 years of writing them in many parts of the world. Subsequent volumes are at this point in the planning stage but will each likely incorporate a couple of the stories found in volume 1 specific to their particular focus, such as the planned volume 4 which will be related to Jim’s unusual African travels.